You’re forgiven if you can’t quite keep up with Aston Martin’s pace of change and fresh product. Accordingly, the DB11 AMR you see here is both a new model AND a special edition, replacing while the Signature variant presented here is one of just 100 available in Aston Martin Racing colors. For the extra attitude it might just be worth the premium over the standard AMR’s $241,000 starting price though. Bottom line, mechanical updates into AMR are pretty minor but put some ground between the and its senior (and considerably more expensive) brother. Torque from the 5.2-liter, twin-turbocharged V12 stays the same at 516 lb-ft but there’s been a small uplift in power from the previous 600 horsepower to 630. Doesn’t sound a whole lot but it makes a big difference to the character of the car. Over 0-62mph it’s still not that startling, the V8 recording 4.0 seconds dead while the new AMR chops a couple of tenths off the original V12’s time and covers it in just 3.7 seconds. Top speed is where the extra grunt really counts though, the V8 topping out at ‘just’ 187 mph while the AMR powers on to 208 mph. Does this count for any more than bragging rights though? Actually yes. Ferrari does its wannabe racecar thing and Lamborghini caters to muscle-vested attention-seekers while Porsche, McLaren and Audi offer various sensibly-suited ways to go very fast indeed. Aston Martin is at its best offering the best of both, combining understated style with a mischievous love of big power and raw dynamics. And if the original V12 DB11 was powerful enough to carry that off, the extra 30 horsepower of the AMR is just enough to tip it into a whole new realm. Because together with the other changes (mainly a tweak to control systems and slight sharpening of chassis settings) it’s gone from having just enough power to a fraction too much. This is a good thing. It helps that it looks a million dollars, even if it only costs a quarter of that sum. 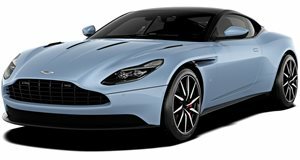 The DB11 is a complicated looking car with myriad possible combinations of body color, contrasting roof rails and aero trimmings. Some of work, some don’t – I’m still suffering flashbacks to the baby blue press demo with purple and cream leather I drove a little while back, for example. With the AMR Aston Martin has finally settled on combinations that really flatter the car. In standard form all the brightwork has been toned down, dark headlight surrounds and smoked rear lights matched with black for the roof, grille, exhaust and front, and rear trim elements. This Signature edition gets even more visual carbon fiber (available optionally on the regular AMR) and a contrasting strip along skirts and around the rear diffuser, accentuating the aggressive nose-down rake and butch stance. Aggressive is the word too. In looks, sound and driving style the AMR takes a decisive step forward from the previous V12. Sure, the is the real wildman and tasked with going after the . But the AMR leaves the GT vibe to the V8 model and instead brings Vantage-style attitude to this top-tier model. I get that the first time I hit the glowing red start button in the center of the dash. The V12 fires with an assertive flare of revs, which sounds similar to the old naturally aspirated 6.0 that served the DB9 for so many years. There might be turbos now but this is still a big-cube engine and, proportionally, the forced induction plays a supporting role, not a dominant one like it does in models with the AMG-donated V8. The fact you naturally pull the right paddle to engage Drive means you’re instantly inclined to stick with manual shifts, a subtle sign Aston Martin wants you to take charge of the AMR, not chill as you might in an equivalent or . These are similarly powerful and luxurious sporting GTs but the AMR upgrades make the DB11 a significantly sharper proposition. Three-stage control for powertrain with your right thumb and chassis with your left mean you can mix and match engine and gearbox response to suspension settings as conditions dictate. For the narrow, bumpy backroads near Aston Martin’s English factory, I opt for Sport on the engine and GT on the dampers, the only frustration being a delay when you push the button, meaning you inevitably press it once again for luck and ‘overshoot’ your intended setting. Distractions like this don’t help with the general levels of intimidation that come with driving a car this big and this powerful on narrow English lanes. I’ll admit it, for the first few miles I’m a little nervous. I can’t see much out of the narrow, slot-like windshield and the AMR feels wide and difficult to place. It’s also massively, massively fast. Where the DB9’s V12 gargled playfully and got progressively more exciting as you went up the rev range the turbocharged engine crashes in with all guns blazing from the first prod of the throttle. It’s really exciting. But the combination of big-capacity response and forced induction muscle means you’re always going just that little bit faster than you intended. OK, a lot faster than you intended. The retuned suspension claims to retain the suppleness of the original DB11 but there’s an edge to this car to remind you that you’re in something seriously potent. Put it this way, you’re not isolated from the 630 horsepower going to the rear wheels, the engine note changing with fluctuating grip levels through the rear tires as the dampers struggle to keep up. Fine on a dry road. Potentially exciting on a wet one. Going up a notch to Sport chassis actually settles the car, the dampers now able to contain the weight shifts. This is a heavy car remember – aluminum construction or not it weighs well over 4,000lb – but the classic front engine, transaxle gearbox layout keeps the bulk of that between the axles. The payoff being the car feels beautifully balanced, the electrically-assisted steering perfectly weighted and the response to it expertly judged. That’s the beauty of the DB11 too. This is a modern car brimming with technology, driver modes and all the stuff we expect in a sophisticated sports GT. But it’s also fundamentally old-school, its feel derived from its perfect weight distribution, the tuning of its chassis and the predictable feedback of its mechanical limited-slip differential. You don’t need gimmicks if you’ve got charisma and, like all Aston Martins, the AMR has that in heaps. I’m soon gaining confidence, and with it speed. Lots and lots of speed. Enough to make me wince every time I glance at the speedo. Only the slurred shifts of the eight-speed automatic transmission blunt its edge, the responses quick but not quite as instantaneous as the dual-clutches used by many rivals. Other than that I’m having a ball. Inside the cosy cabin, the Mercedes switchgear and infotainment adds a new level of tech and integration but the hand-stitched leather surrounding it has a finish and smell that you don’t get in more mass-produced cars. True, Aston Martin has sold over 4,000 V12 DB11s so it’s hardly a man in a shed operation. But you get the sense this car was assembled by human hands, not machines. And people just love it. Even with flouro stripes on. “Just enough,” murmurs one gent in a quiet Cotswolds village straight out of the ‘scapes’ function in Gran Turismo Sport. And he’s right. In this most English of settings the transformation from DB11 to AMR ‘a little too much’ turns out to be just enough.